Did you know the world’s largest salt flat is in the Andes Mountain Range? The nearly 11,000 square-kilometer (6,835 square-miles) landscape is what is left of a prehistoric lake that went dry in what is current-day southwest Bolivia. That lake left behind brilliant, bright-white salt, rock formations, and cacti-studded islands that share the unique ecosystem with pink flamingos. 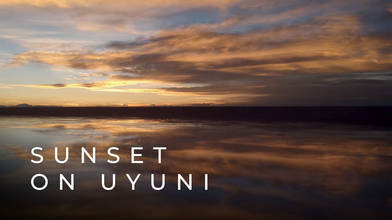 This drone video of Salar de Uyuni at sunset by vieuma is absolutely stunning. The orange, pink and yellow light reflecting on the ground is a perfect mirror to what is above, making the scene look like pure magic.